Bryce Vine Interview - "Drew Barrymore," "La La Land"
Over the past five years, since he released his EP Lazy Fair in 2014, Bryce Vine has been steadily writing and releasing songs that capture his unique blend of hip-hop and pop, and reflect his distinctive personality. In 2016, Vine followed up his Lazy Fair EP (that featured the single “Sour Patch Kids”) with another solid EP called Night Circus (containing the key cuts, “Nowhere Man” and “Glamorama”). Notwithstanding the impact Vine’s earlier releases had, it was in the second half of 2018 that he truly emerged with his breakthrough hit, “Drew Barrymore” (named after the actress). This single elevated Vine to a whole new level of popularity, reaching the Top 50 on Billboard’s Hot 100 chart and Top 20 on Billboard’s Pop Songs and Rhythmic Songs charts. Impressively, the video of “Drew Barrymore” has attracted over 37 million views on YouTube. And it was the initial success of “Drew Barrymore” that led to Vine signing a label deal with Sire Records, the historic, boutique label that is owned and distributed by Warner Bros. Records. Now in 2019, Vine has just released his excellent new single, “La La Land” (featuring YG). This song colorfully captures life in Los Angeles, and blends his unique lyrics with a propulsive beat. Also, “La La Land” features a very hooky chorus that is easy to sing along to. The single is now one of the most added songs at pop radio, and is already moving up Billboard’s Rhythmic Songs chart. Notably, Vine is also a charismatic live performer who completed his first U.S. tour as a headliner. And currently, he is in the midst of a college tour, playing shows on many campuses across the country. DK: I read that you were born in New York and then moved to Los Angeles when you were young. How did you get started as a musician and songwriter? 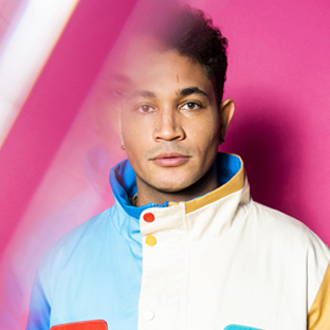 Bryce Vine: My whole family moved from New York to L.A. when I very young. We would go back to New York…me and my dad would experience New York in the summertime. My dad was always playing jazz in the car, and my grandfather was playing jazz, so that was a big part of [my music growing up]. I just love the way that music sounded. And on the other side with my mom (who’s an actress), she showed me the theatrical side of things. She took me to ragtime before I was old enough to even care about the significance, and we would sing Disney soundtracks. So I just associated music with happiness when I was very young. When I was 13, I decided to write my own songs, so I could make the (musical) therapy myself. I taught myself how to play guitar and started writing songs. DK: You attended the prestigious Berklee College of Music in Boston. You must have been a good musician at that age, to be invited to attend Berklee. Vine: Yeah, but honestly it didn’t feel like it. I went from singing and playing guitar in a punk band in high school, to going to Berklee, where everyone was like the most talented person that I’d ever met. And I wasn’t sure what kind of music I was going to do next, now that I wasn’t in the punk band. But I just kept trying different things…I went into jazz, did a little bit of reggae, and the gospel ensemble. I tried to get a grasp of all these different genres of music, so I could create my own thing. DK: I read that you met your producer Sir Nolan (Lambroza) at Berklee. How did you connect with him there? Vine: I met Nolan…I think he threw a party my freshman year, and I helped him clean up his house afterwards (laughs). That’s how we met. We started hanging out; we didn’t even play music together. We were just friends from very different backgrounds, [but] I think we just saw the world in the same way. DK: When you write with Sir Nolan, how do you like to work together? Do you mainly write the lyrics and melody, and he creates the beats and tracks? Vine: It’s all collaborative. Sometimes he’ll start with a beat, and I start writing over it. Or sometimes I start the beat and he elevates it. That’s how we wrote “Drew Barrymore”; I made the beat one day, and wrote the lyrics over a span of a couple weeks. And then I played it for Nolan, and he made it sound radio-ready and added a lot of musicality touches to it that I would have never thought of. DK: How did you write “La La Land”? Vine: “La La Land” was a different story. We came in with the acoustic guitar riff—me and my buddy JT wrote the song over an acoustic—and then Nolan added all the music to it. DK: With “Drew Barrymore,” what inspired you to write a song with that title, and can you talk about the story of this song? Vine: I was at the studio one day and I started making the beats for it. I knew it was cool immediately…the whole vibe of it was very ‘80s, and I wanted to challenge myself to write a romantic song that didn’t focus on looks. So that was the basis of the song…to have a setting, somewhere kind of cool, and what you would do in a room with somebody, you know, that you were in love with. I didn’t have the chorus for that song…the whole Drew Barrymore thing, for about two months. I couldn’t figure out what it was. I went in with different writers and I tried to write different hooks around the verses. Then I went back on my phone, because I always keep little voice notes on my iPhone for ideas of songs. I went back a couple years, and I found something that (hit artist & songwriter) Julia Michaels had sent me, where she said, “You’re the next Drew Barry and I want more.” So I thought…that’s kind of cool. (the actress) Drew Barrymore represents the girl that I’m talking about. She’s kind of Hollywood royalty and yet she’s cool, she’s sweet. She’s the girl next door, but also a badass. And the song just all fit together. DK: You’re signed with Sire Records, which is a famous, boutique label. How did you decide to sign with Sire? Vine: I was still an independent artist when I put out “Drew Barrymore” online. Over the years, I’ve met with different labels, but no one was jumping at the bit to sign me. We would go into meetings—I remember I’d have to explain to people, that I was rap and pop. And they were like, “Well, which one is it?” They’d say, “He’s not really rap and he’s not really pop.” And that’s literally the lane that I’m in (combining both). But it took forever for that to be understood what I was trying to do. Then when I put out “Drew Barrymore” independently, the wheels started really turning. In one week, I got offers from three or four labels, including Sire Records. And as soon as I met Rani Hancock, the president (of Sire), I knew that this is who I wanted to build my career with. DK: Are you working on a new EP or album? When will it be released? Vine: I have an album coming out and it’s called Carnival. It will be out this summer. My songs “Drew Barrymore,” “La La Land’ and “On The Ball” will be on the album. DK: Thank you Bryce for doing this interview. Is there anything that we haven’t talked about, that you’d like to mention for this article? Vine: I’ll mention that I just finished my first headline tour. [All the shows were] sold out which was a relief (laughs), and it was amazing to experience so many people singing all the lyrics to your songs. So I’m excited to get back on the road, and I’m doing a college tour right now. I was named the most booked college act of 2019, so I’m trying to earn that title (laughs).